but it soon turns to a bright green. 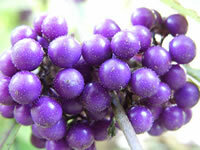 berries which ripen to intensely purple color by early fall. The bright purple berries will remain on the plant after the foliage drops providing a beautifully contrasting effect in the garden during the winter months. 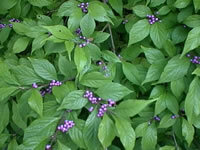 Beauty Berry plants grow to a height of 6-8 feet with a 4-6 foot spread. This deciduous shrub is hardy in USDA zones 6-8. Your Beauty Berry should be planted in full sun for maximum flowering and berry production, but they will grow in partial shade as well. Beauty Berries should be grown in rich, loamy, well-drained soil that has been supplemented with a generous amount of compost at planting time.Water regularly and thoroughly, especially during the first growing season. Feed lightly every month during the growing season with a balanced, liquid fertilizer. 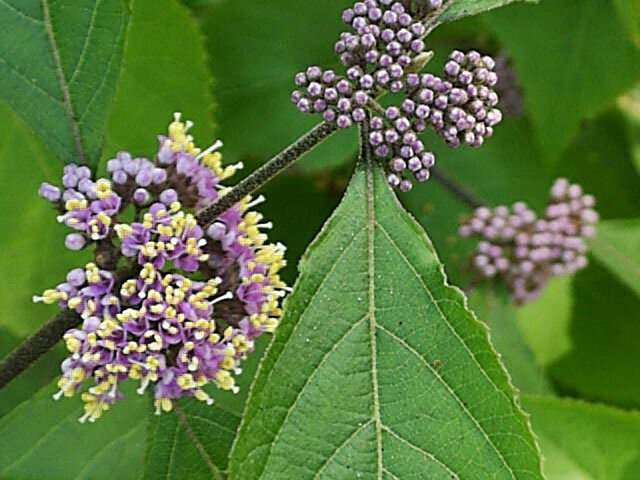 Blooms form on new wood in the spring so cut back older branches in late winter or very early in the spring to produce stronger flowering canes. Lower branches and spindly growth can be removed in the spring to help shape the plant. 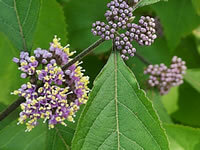 Callicarpa plants can be propagated with tip cuttings taken during the summer months.